NASA engineers have launched a new website tool that calculates the requirements for robotic and manned missions to asteroids, comets, planets and other destinations in the solar system. Called the Trajectory Browser, the new website was developed at NASA's Ames Research Center, Moffett Field, Calif. By searching for their destination on the browser, scientists can get estimates about the launch energy, launch dates, duration and other requirements of their mission. 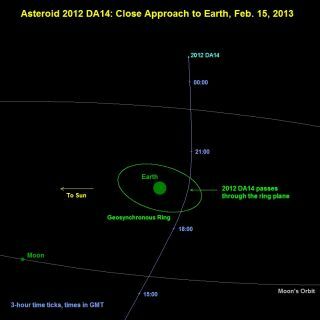 For instance, scientists could use the tool to find information about sending a spacecraft to rendezvous with asteroid 2012 DA14, a space rock about half the size of a football field that gave Earth a close shave last month. The Trajectory Browser calculates that potential launch dates for such a mission would be Feb. 24, 2014, Feb. 19, 2018, and Feb. 22, 2019, according to NASA. To calculate potential trajectories from Earth, the program draws on the known paths of asteroids, comets, planets, moons and other objects being mapped and monitored by NASA’s Near Earth Object Program and the online HORIZONS system managed by NASA's Jet Propulsion Laboratory, in Pasadena, Calif.
"The Trajectory Browser website is best used as a first-cut tool to assess the existence of trajectories to small bodies and planets and provide ball-park values on launch date, duration and trajectory requirements," Cyrus Foster, an aerospace engineer at the Ames Mission Design Center and lead developer of the Trajectory Browser, said in a statement. "The website is flexible enough to provide information about various types of missions such as rendezvous, sample return or flybys and is routinely updated with the latest asteroid and comet discoveries made by astronomers and NASA missions." You can search for more paths yourself on the Trajectory Browser website.